Tofu Kale Scramble with Genesis! All the sweet and savory tastes you need to get your morning off to a sunny start! Try this tasty vegan tofu scramble with a dollop of Toby’s Tofu spread, then pair it with a Genesis juice of your choice. This is sure to fuel your day for success! Sauté onion for 2 minutes. Crumble tofu and spices, cook for another 5 minutes or until lightly browned then add kale and cook until wilted. Add to a plate, top with avocado, parmesan (we used Follow Your Heart) and serve with Genesis juice of choice. Enjoy! Nog is one of those creamy, rich drinks we can enjoy all through the winter. 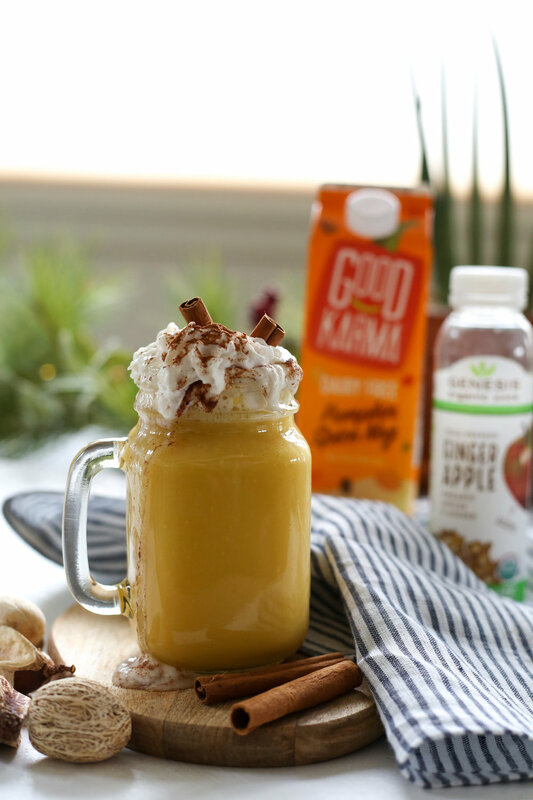 This perfectly spicy pumpkin nog is a great way to feel the holiday spirit. Almond whip and cinnamon sticks indulge reminders of horchata, but all grown up. Enjoy it by the fire for a perfectly cozy night in and revel in this uniquely delicious smash up of flavors. Mix nog, rum, and apple juice in a saucepan and heat. Pour in a glass or mug, top with almond whip, cinnamon sticks, and a dash or cinnamon. Enjoy immediately! All your creamy holiday nog dreams come true in this delicious vegan (!) infusion. We took SO Delicious holiday nog and mixed with our PNW Apple for a perfectly delicious, rich, and refreshing version of a holiday favorite. Make this delight for a holiday get-together or just to enjoy during a cozy night at home! A classic fall favorite that can’t be beat! Curl up with this cozy crisp on a rainy fall weekend or make it for the next harvest get together! Simple, easy ingredients with the fresh, juicy flavors of apple are a wonderful combination to kick off one of the most beautiful seasons!